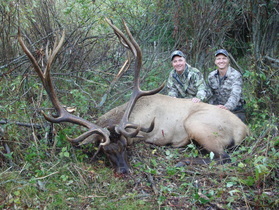 As you can see from the photos below Silvertine specializes in 400" plus bull elk. Our Genetics are improving each year and our antler average is getting bigger each year. For a truly monster elk, we recommend a 400" class bull. Silvertine kills more 400" bulls than any other hunt ranch in Canada . . . . . and that NO BULL! Richard Davis 486" Rocky Mtn.